Philadelphia Eagles rookie tight end Dallas Goedert first made his name known to Dallas Cowboys fans when David Akers so emphatically announced him as the Eagles 2018 second-round draft pick. Unfortunately for the Cowboys, this isn’t the only time Goedert would cause a stir with them in 2018. After breaking out for over 1100 receiving yards in his final season at South Dakota State, Goedert was the Eagles’ offseason fix to replace former tight end Trey Burton in 12 personnel situations. The Eagles’ decision paid off, as Goedert posted the second-highest overall grade of any rookie tight end while also grading out higher than Burton, who is now with the Chicago Bears. Goedert’s first year with the Eagles proved to be a successful one, as he showed that he could be a supplement to teammate and Pro Bowler Zach Ertz in the passing game. Finishing with 334 yards receiving and three touchdowns, Goedert may not have seen the volume that Ertz had, but he did prove to be more efficient. Even though Ertz saw 111 more targets over the full season, Goedert finished with a higher reception percentage (76.7%) and passer rating when targeted (110.0). 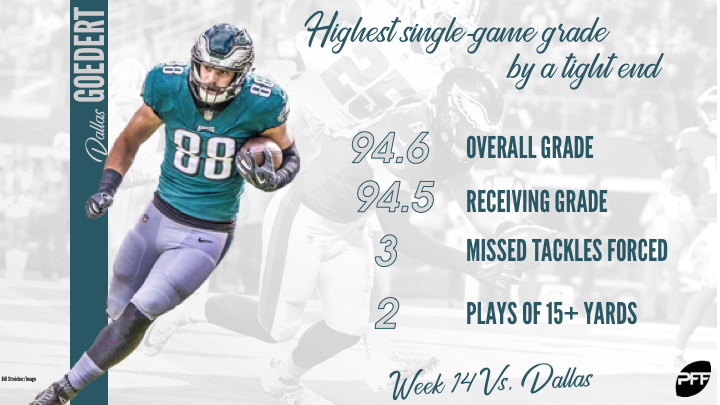 While Goedert’s season-long performance is impressive for a rookie, there’s one game in particular that stands out, as it happened to be the highest-graded game by a tight end in 2018. Who was it against? You guessed it—the Dallas Cowboys. In the Eagles Week 14 trip to Dallas, tensions were high in an overtime thriller, as the two NFC East rivals were jockeying for first place in the division entering the final stretch of the season. Despite the Eagles losing 29-23 in overtime, Goedert made a name for himself on the playing field this time by posting a 94.6 overall game grade across 31 total snaps. On the surface, the stat sheet doesn’t wow you, but Goedert was highly effective in multiple phases on offense. Drawing coverage against the Cowboys’ linebackers, he caught four of five targets for 44 yards and a touchdown, resulting in an outstanding 142.9 passer rating when targeted. Goedert had a pair of catches against both Jaylon Smith and Leighton Vander Esch in coverage, but it was on Smith where he did the most damage, racking up 29 yards, two first downs, and a touchdown. However, it could have been much more. In the fourth quarter, with the Eagles trailing 23-16, quarterback Carson Wentz found Goedert down the seam. Goedert hauled in the contested catch and span away from two would-be tacklers before taking it over 50 yards after the catch for the score. The play would later be reversed on a questionable offensive pass interference call. Goedert also showed off his pass-blocking abilities in this matchup by not allowing a single pressure when staying into pass-protect. Albeit in only four snaps, this performance was a microcosm of Goedert’s season that saw him yield only two pressures over 53 pass-blocking snaps. Despite sitting behind one of the top tight ends in football, this game gave a glimpse into what Goedert can become, and while his receiving volume was on the lower end during his rookie campaign, it’s clear the potential is there. Keep an eye on Goedert going into year two, as there’s no doubt that Doug Pederson and company should find ways to get him involved more on offense.